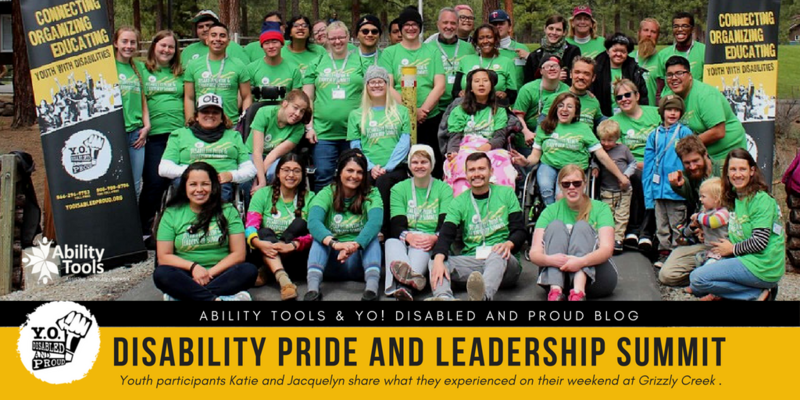 Disability Pride and Leadership Summit | Where It's AT. The Ability Tools Blog. By Jacquelyn E. and Katie J. 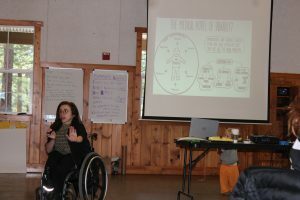 At Grizzly Creek Ranch* (GCR) in Portola, CA we had a statewide summit for Disability Pride and Leadership. The purpose of the summit was to bring together youth with disabilities from across California to start making a campaign for Disability Pride Month in July. When we arrived at the camp, we met people who lived throughout the state, from L.A. to Oakland. We received a t-shirt, name tag, backpack, and a workbook that had the program and agenda for the weekend. The campgrounds were accessible to everyone with all types of disabilities. There were paved pathways to all of the buildings on the property, and the bathrooms and showers were wheelchair accessible. At the summit, we participated in a variety of activities. The one activity that everyone was excited for was the zip line. The staff at GCR recently made the zip line accessible for everyone to use. The zip line was one of several activities we participated in on the ropes course. For the ropes course, we were split into our cabin groups. The first thing that we did was get our helmets to use on the zip line. Grizzly Creek Ranch (GCR) is completely ADA accessible. 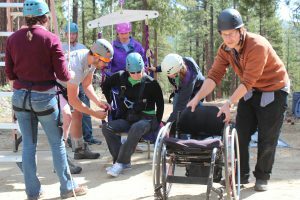 GCR staffers help a youth in wheelchair get ready for the ropes course. Our group then went over to the Matrix, a grid on the ground with blue tiles. We took turns stepping on the tiles one-by-one, trying to figure out the pattern of the Matrix. If someone stepped on the wrong tile, they “fell into the Matrix” and it was someone else’s turn to go. Once we figured out the pattern, we had to work together to make sure everyone got through the Matrix. Eventually, our whole team made it through the maze! After we finished up the Matrix, we grabbed our stuff and headed up the hill to the zip line. We wore our helmets and the GCR workers helped us put on a two-part harness. Once we had the harness on, we sat in a purple pouch like seat that was hooked onto the zip line. Only one person was able to do the zip line at a time. When everything was ready, the workers would pull you up to the top of the zip line and give commands. They then would release you, letting you fly through the air! The GCR staff made sure that everyone was able to participate and felt comfortable. At the end of the day, we had the choice to have s’mores at the campfire or watch a movie. Even though it was cold outside, almost everyone went to the campfire because we had to wait an hour for the movie to download. Once the movie was ready, some campers chose to go inside to watch it. The movie was called Bottom Dollars. It taught us about sheltered workshops, and that those of us who work in one can legally be paid subminimum wages. Each day we would meet in the lodge and discuss how to start the Disability Pride Campaign. Our discussions included what it means to be disabled and what the word intersectional means. In our group we all had a variety of intersections and disabilities. Allie Cannington explains the difference between the “Social Model” and the “Medical Model” of disability. One of the lessons had a diverse panel of people that sat in front of us and answered questions. One of the questions that was asked was “How do you feel about ableism?” Another question that was asked was “Have you ever been made to feel ashamed because of your disability?” Everyone at the camp answered this question, and we all had our hands raised. Looking around the room and seeing that everyone was raising their hand, we both felt a little relief. We also felt connected, knowing that we were not the only ones with these feelings. We then started creating our Disability Pride Campaign. For this activity, we were placed into five randomly picked groups. This allowed us to work with different people on the campaign and have a variety of perspectives. Each group worked together to develop a Disability Pride Month campaign. We then shared our campaign ideas with the whole group. This Leadership Summit focused on uniting people with all different types of disabilities to know that we aren’t alone. We need to stand up for ourselves and our community. Having a disability isn’t a bad or negative thing. After being at this Leadership Summit, we both learned a lot about team building. Just because someone might be different in some type of way doesn’t mean that they can’t be a key person in your group. * Ability Tools Note: Grizzly Creek Ranch is a fully ADA accessible facility in Portola, CA, just 45 minutes from Reno, NV and two hours from Sacramento, CA.The entire campus is ADA certified and accessible. The swimming pool that is equipped with lifts as well as ramps and the ropes course is accessible for wheelchair users.